VANCOUVER, BC / ACCESSWIRE / May 30, 2018 / Margaret Lake Diamonds Inc. (TSX-V: DIA; FSE: M85) (´´Margaret Lake´´ or the ´´Company´´) is pleased to report that exploration has commenced on its Diagras Property (´´Diagras´´ or the ´´Property´´) located in the Northwest Territories, Canada. Diagras is a contributing Joint Venture (the ´´Joint Venture´´) between Margaret Lake, which acts as project operator and holds a 60% interest, and Arctic Star Exploration Corp. (ADD) which holds a 40% interest. Diagras is located in the prolific Lac de Gras diamond field, Northwest Territories, Canada and just 35 km from the world-class Diavik diamond mine. The Property lies directly on trend with the Diavik deposits currently being mined by a joint venture between Rio Tinto and Dominion Diamond Diavik. The Diagras land package consists of 18,699 contiguous hectares of mineral claims containing 12 previously identified kimberlites. The Joint Venture was also successful using this strategy during the spring 2017 exploration program. This work revealed gravity and EM anomalies proximal to known magnetic kimberlites that constitute compelling drill targets. At the Jack Pine kimberlite, which is one of the largest kimberlite complexes in the Lac de Gras diamond field (over 1.5km in its longest dimension), the geophysical methods (ground gravity, EM and magnetics) highlighted obvious magnetic kimberlite phases drilled by previous explorer De Beers Canada while also successfully defining a new kimberlite-like geophysical expression. This area remains to be drill tested. Previous drilling elsewhere in the Jack Pine kimberlite complex has demonstrated it is diamond bearing. Margaret Lake Diamonds Inc. (TSX-V: DIA) is a diamond exploration company focused on the Northwest Territories, Canada with two exploration properties. The Margaret Lake project is adjacent to Mountain Province Diamonds Kennady North project and in close proximity to Gahcho Kué, the newest Canadian diamond mine owned by De Beers and Mountain Province Diamonds. 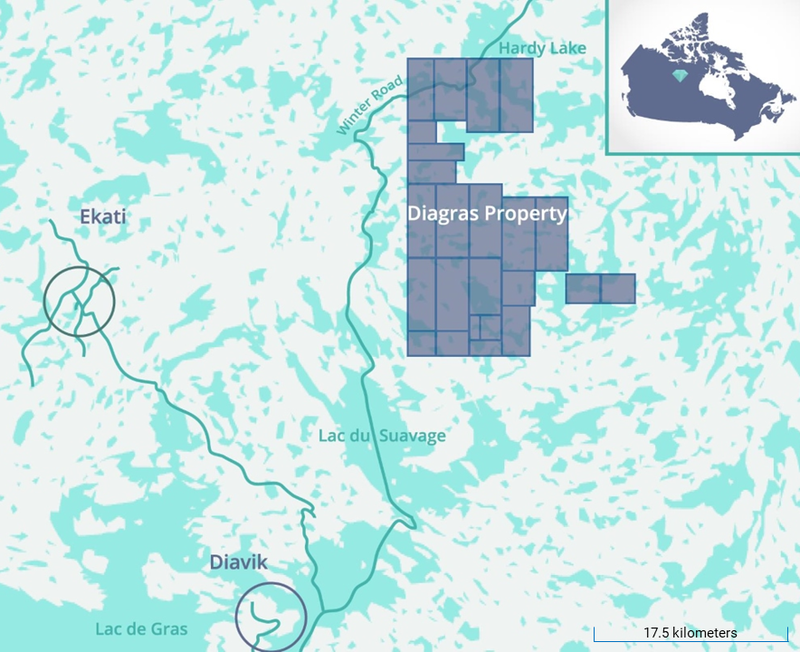 The Company also has a 60/40 joint venture with Arctic Star Exploration Corp. (ADD) to explore the Diagras property, which is comprised of 23 claims totaling 18,699 hectares located in the prolific Lac de Gras diamond field.